Did you know that the saw cutting chains vary widely in type, size, and features? This is simply because the chainsaws also exist in different sizes and their applications vary.When you plant o replace your chainsaw chain, it’s important to have all the information regarding your chainsaw and chain. Matching the correct chain to your chainsaw becomes easy if you’ve got the right measurements, but the process is a little bit complicated since the chains are measured in a unique way. The information below talks about the different types and size of chainsaw chain, and how to get the right measurements for your chainsaw. Pitch: the measurement used to describe how close the links are together in the chain. It’s the distance between any three rivets divided by 2. Good news is that chainsaw manufacturers note this number on the machine (mostly on the guide bar) or in the manual. Gauge: parts of the chainsaw that enters the guide bar are known as the drive links. That is the bottom part of the chain. Gauge is thus used to describe the thickness of the drive links. You’ll need to match the correct gauge to your chainsaw so that the chain fits perfectly on your guide bar. Like pitch measurements, gauge value is also indicated on the guide bar of your machine. Most of the chains out there fall under this level which means they have anti-kickback features to help reduce accidents related to kickback. Kickback is the incident that occurs whenever the guide bar upper nose comes into contact with an object during operation. This section of the guide bar is referred to as “Kickback Danger Zone.” The contact results in increased resistance force and instantly throws your chainsaw back in the operator’s direction. Because anti-kickback chains limit the size of the material being cut, the overall cutting process is a bit slower unlike with the more aggressive chains. However, note that these chains require less cutting power and bear narrow kerfs. These chains space a link between their cutting teeth. This facilitates lower-resistance, grittier, and faster cutting. If the chain you plan to buy isn’t listed as low-kickback or full-skip, the chances are high that it’s a regular chain for professional use. These chains space two links between the cutting teeth, offering a low-resistance cutting. Such chains are usually used for chainsaws with guide bars measuring 24” or more. If you correctly use chains of this aggression level and length, you’ll love the extra length feature because you won’t have to bend down to reach your working area. NOTE: These chains are specially made for trained, professional use, and most saws have no application that calls for these chains. Manufacturers have adopted various design features that help keep the chains lubricated during the entire working period. These are usually holes and/or grooves in the chain teeth or links that make the lubricant stay on the teeth. The chains have design features that enable them to stay sharp as the chain circles the guide bar. As you know, chainsaw sharpening is one of the main maintenance hassles faced by chainsaw users and is best done by pros. Using the above chain will, therefore, save you time and money. You should pay close attention to the vibration level of your chain. Why? 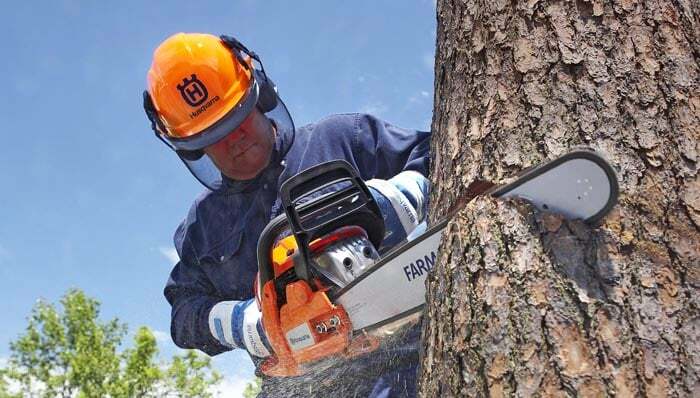 Simply put, long-term vibrating tools such as the chainsaw result in serious health issues to your hands such as numbness, pain, burning sensation, etc.In response to this, chainsaw manufacturers have designed chains with features that help reduce the vibrations levels. This is achieved by introducing spaces between the guide bar and the chain to act as a buffer against friction (and thus, vibration). Carbide is an extremely sturdy and durable material (but it’s quite brittle easily shatters when struck with force). Chains engineered from carbide are intended for more severe environments that would wear out the regular chain faster. Carbide chains are usually expensive and should, therefore, be only considered for workplaces involves sand, dirt, cold weather or any other rough conditions. Chainsaws come in different dimensions- sizes and types- and getting the correct style for your chainsaw requires you to understand all the dimensions available. Luckily, we have provided you with all the sizes and types of chains you’re likely to meet on the market today. Before you head to the stores, remember to jot down the three critical measurements- pitch, length, and gauge. This way, you’re halfway done looking for an appropriate chain for your saw.